It is nearly autumn which means a change in fashion, makeup, and lifestyle! Autumn has to be one of my favourite season, due to the fact that it is not entirely cold but not summer, it's the season where you can wear a dress with knee high boots. It is the season where it still doesn't get dark quickly and it's the season, more importantly, before Christmas. 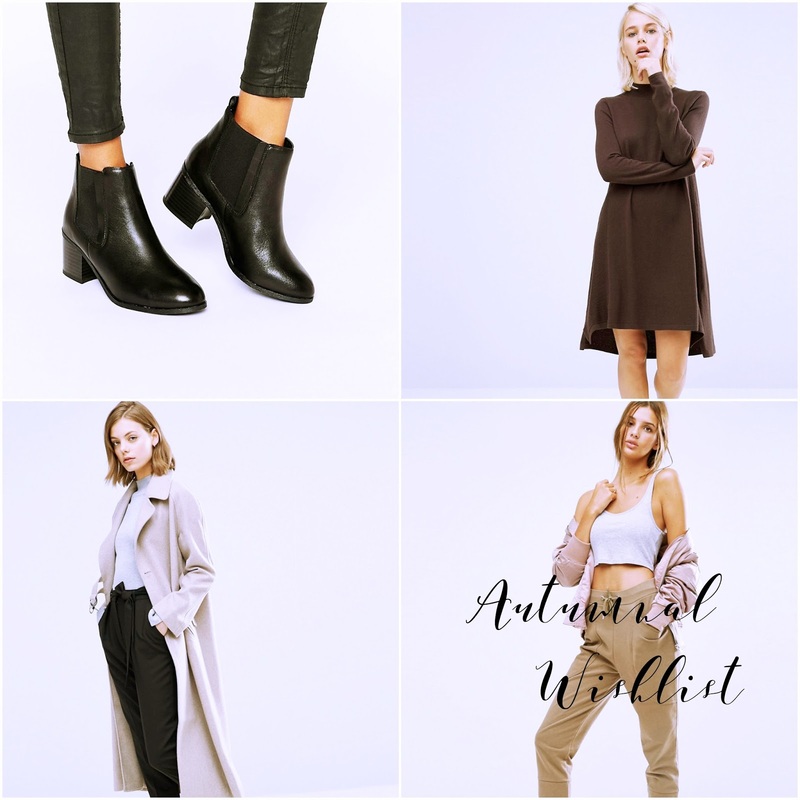 As Autumn is literally peeking around the corner, I thought I'd share my autumnal fashion wishlist. One of the items that is on my list this autumn/winter is black heeled boots which would look nice with light-wash jeans and this ASOS V-Neck Jumper. So simple but yet stylish. Or these boots would also look lovely with the ASOS Cashmere Knit Tunic Dress on an Autumn evening. Boots are one of the easiest shoes to pair with because they go with nearly everything, that's why on my autumn wishlist the ASOS Effie Leather Ankle Boots are at the top followed by another colour other than black which is ALDO's Fearian Leather Ankle Boots. I am definitely a person of leisure and relaxing. All I do honestly is lounge around in jogging bottoms and oversized shirts, so to add to my collection jogging bottoms I really like the look of these ASOS Harem Joggers, they look so comfortable and I love the colour of them! These would look really nice with some white trainers like the model is wearing below. For that onesie look, I love the colour of this One Day Tall Wrap Jumpsuit which will be easy for days where you don't want to wear a lot or put a lot of thought into your outfit. I do love dresses, despite the weather getting a bit colder it is still possible to wear dresses like ASOS Wrap Maxi Dress for weddings, dinners or more! This would look nice with a long black dress something along the length of this ASOS Duster Coats. Long coats really look nice on evenings out, they create the model look. Even though long coats are beautiful, nothing can beat a bomber jacket. Bomber jackets were on everyone's list this year even mine but as it is getting colder it is necessary to have those warm bomber jackets like the ASOS Denim Washed Faux Collar Bomber Jacket! What is on your autumnal wishlist?